Specialties:An international professional speaker and a foremost expert in personal and professional success. Some of Kurek's personal clients include Hollywood “A” list movie directors, music composers, sports stars, Olympic Gold medal athletes, business leaders, and even oil executives in Kuwait. 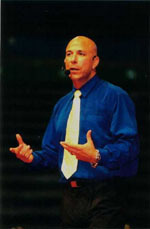 Kurek also trains other speakers, authors and coaches to be very successful in their professions. For the ones who have applied his specific tactical strategies, they have created multi-million businesses.